A reconstructed perspective of Juling Crater, where a patch of water ice is slowly growing on the northern wall. Researchers studying the warmer region of Ceres — the largest object in the asteroid belt between Mars and Jupiter — have noticed that a patch of ice has grown larger over time. In addition, a separate team found carbon-rich minerals on Ceres' surface that do not last long . Together, the new discoveries suggest that water still has a powerful presence on the tiny world. "The same process can be at work in the crater floor of Juling, providing a replenishment of water under the soil that sublimates and in part condenses on the cold wall," Raponi told Space.com by email. A map of Ceres reveals the distribution and intensity of carbonate material, much of which may be associated with water. Ceres is classified as both a dwarf planet and an asteroid. When the Dawn spacecraft arrived at Ceres in 2015, it found a nearly featureless world with a rocky surface. A single mountain, Ahuna Mons, rose from the surface. Bright spots within craters were the only color variations on the otherwise dull, gray world. As scientists probed the dwarf planet, they found hints that Ahuna Mons was not just a mountain, but a cryovolcano — also known as an ice volcano. Thick water ice may have risen to the surface in the past, flooding the plains with ice lava. 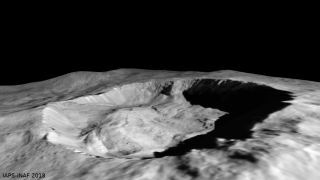 Researchers found hints that other icy cryovolcanoes may have dotted Ceres in the past before slowly easing back into the landscape, their heights spreading outward across the landscape. Eventually, Dawn revealed that the 130 bright patches contained sodium carbonates, salts that forms on Earth as water evaporates from a body of water like a lake, or in hot springs. It's hard for water to stick around on Ceres' surface. The lack of atmosphere on the tiny world means that sunlight causes the liquid to boil away immediately, leaving behind the rest of the minerals carried with it to the surface — such as carbonates. "Carbonates are minerals that are very important because they can give us information about the presence of water on Ceres in the past and in the present," Carrozzo told Space.com by email. Furthermore, they "are among the most interesting minerals researchers can observe on the planetary surface," he said. "They are key minerals for understanding the Ceres environment because they are indicators of neutral to alkaline water." Carrozzo's team mapped the entire surface of Ceres using Dawn's Visible and Infrared Spectrometer, searching for carbonates. Their results revealed that some of the regions required different forms of the sodium carbonates than Dawn had identified previously. The new traces of sodium carbonates are more likely to carry water inside their structure than those found before, as their signals are a close match to minerals such as trona and thermonatrite. "Trona is a sodium carbonate with two water molecules in its structure," Carrozzo said. "When we observe it on a planetary surface, we are sure that water played a role in its formation." These views of Ceres from NASA's Dawn spacecraft show Ahuna Mons, the tallest mountain on the dwarf planet. The mountain is one of the few places on Ceres with significant amount of sodium carbonate. Dawn's results revealed that most of the sites rich in sodium carbonate are found in the younger terrains along domes and mounds, as well as in the material thrown off by the impact that formed craters. While it is possible that the carbonates form in the heat of the impact, the researchers favor the idea that brines beneath the surface welled up to ooze through the crust. Such cryovolcanism requires that Ceres' internal temperature stay warm enough to keep water from freezing completely, remaining instead as cryomagma that's rich in sodium carbonates, Carrozzo said. In addition to hinting at current activity on Ceres, the team's results suggest that the dwarf planet may have formed farther out in the solar system than the asteroid belt, and previous discoveries of ammonia-rich clays on the dwarf planet support that idea, Carrozzo said. "Sodium carbonate is one of the compounds found in the plumes of Enceladus, a moon of Saturn," he added. "This finding reinforces the idea that Ceres formed in the outer solar system." Though water ice has been found in shadowy craters, most of these craters lie near Ceres' north pole. Juling Crater, however, is located in the dwarf planet's midlatitudes, where the sun is higher overhead and shadows are harder to maintain. The northern wall of the 1.6-mile-deep (2.5 kilometers) crater is almost always cloaked in shadows. It is illuminated only by light reflected from the crater floor, Raponi said. Juling Crater has a patch of ice on its northern wall. Using Dawn's Visible and Infrared Mapping Spectrometer, Raponi and colleagues were able to watch the ice grow from 3.6 square km to 5.5 square km (1.4 square miles to 2.1 square miles) over six months. This photo by NASA's Dawn spacecraft shows the floor of Juling Crater on the dwarf planet Ceres in the asteroid belt. The crater's floor shows signs of ice and rock flows much like glaciers on Earth. There are two ways the visible ice chunk can grow, the researchers said. The first possibility is that the ice could already exist beneath the shallow exterior — previous studies have shown that water ice covers much of the dwarf planet's subsurface — and then landslides along the side of the crater could slowly reveal the material, Raponi said. In that case, the itself ice wouldn't be getting larger; rather, it would be uncovered slowly. However, the team's preferred solution involves water vapor. Geological formation similar to Earth's rock glaciers cross the floor of the crater, with a large one at the base of the northern wall. The rock walls may be the source of the ice, as the crater wall traps water molecules coming from just beneath crater floor. "We suggested liquid water percolating under the surface and then freezing to the surface of the cold wall when exposed," Raponi said. The process would require a source of heat that is currently unknown, but he said other indications of water-rich minerals, such as those characterized by Carrozzo and his colleagues, suggest similar processes are occurring across Ceres. "The increasing solar input, because of the changing season and decreasing distance of Ceres from the sun, could be the driving force of the sublimation of water from the subsurface of the floor that then, in part, condenses on the surface of the shadowed wall," Raponi said. He pointed out that Carrozzo's research suggested a source of water-rich material rising from beneath the surface as the source of hydrated carbonates. A similar process could replenish the rock glacier on the crater floor, providing a source of water that helps to grow the icy region. The new research reveals that Ceres isn't an inert ball of rock but rather a constantly evolving icy world. "In general, the two works show that water is currently available on the surface of Ceres, and produces geological and mineralogical changes on its surface," he said. Both papers were published yesterday (March 14) in the journal Science Advances, and can be seen here and here. Editor's Note: A conversion of kilometers to miles was corrected; Raponi and colleagues saw the ice grow from 3.6 square km to 5.5 square km (1.4 square miles to 2.1 square miles). Follow Nola Taylor Redd at @NolaTRedd, ;Facebook, or Google+. Follow us at @Spacedotcom, Facebook or Google+. Originally published on Space.com.